Traffic to your website: When you use the proper messaging, social media engagement can drive traffic to your site. Referrers to your website: One common measurement in web traffic analysis is the number of referrers, or sites that refer traffic to your website. Note whether you see an increase in traffic from Facebook or Twitter or another social media tool you use. Marketing e-mail subscribers: If you’re using e-mail marketing to reach customers or you’re sending a regular e-newsletter, note the current number of subscribers and then the changes based on integrating e-mail marketing into your social media messaging and networks. Customer service inquiries: Note how many calls or e-mails you’re receiving, and then begin tracking how they’re handled in social networks. You may even receive fewer calls and e-mails, so be prepared for the shift to the customer relations aspect of social media engagement. Transactions: Whether a transaction involves people signing up for demos or consultations or actually purchasing products, the numbers should change because of social media engagement. If not, reexamine how you’re encouraging people to transact. If you don’t set benchmarks that reflect how you’re meeting business goals, you can’t accurately measure the impact of your social media engagement activities. If you’re using a management-and-measurement tool, pay for a professional-level subscription that lets you run reports and save them. Run reports at least monthly to track your progress, and then archive them. Check the numbers weekly if your networks experience a lot of activity or you’re altering your engagement tactics. 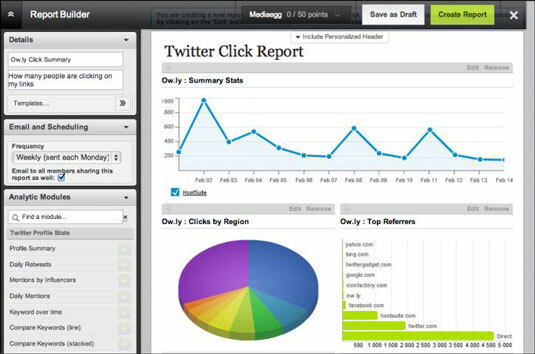 Record your numbers daily, such as an increasing number of fans and followers.